Mr. Naipaul in 2001, the year he won the Nobel Prize in Literature. In many ways embodying the contradictions of the postcolonial world, Mr. Naipaul was born of Indian ancestry in Trinidad, went to Oxford University on a scholarship and lived the rest of his life in England, where he forged one of the most illustrious literary careers of the last half century. He was knighted in 1990. [post_ads]Yet Mr. Naipaul exempted neither colonizer nor colonized from his scrutiny. He wrote of the arrogance and self-aggrandizement of the colonizers, yet exposed the self-deception and ethical ambiguities of the liberation movements that swept across Africa and the Caribbean in their wake. He brought to his work moral urgency and a novelist’s attentiveness to individual lives and triumphs. An often difficult man with a fierce temper who dressed sedately in tweed jackets, Mr. Naipaul had a face of hawklike severity. “After one look from him, I could skip Yom Kippur,” Saul Bellow once joked. If displeased by questions, Mr. Naipaul would sometimes walk out on public appearances and hang up on journalists. Although he could be mischievous and had a deep sense of humor, he was prone to melancholy. Mr. Naipaul practiced yoga until his back grew too weak, and often lamented that writing took a physical toll. He would spend months cogitating at home in London or more often in his book-filled cottage in the Wiltshire countryside, outside Salisbury, which he shared with his first wife and later his second, and with a black-and-white cat named Augustus. He continued to write novels even after declaring the form a 19th-century relic, no longer able to capture the complexities of the contemporary world. Yet his fiction was always in conversation with his nonfiction; each new book built on the ones that came before. Mr. Naipaul wrote relatively slowly, sometimes only a paragraph a day, and was intensely protective of his work. Diana Athill, who edited 19 of his books at the London publisher Andre Deutsch between the 1950s and the ′70s, said editing Mr. Naipaul involved providing him with much reassurance. 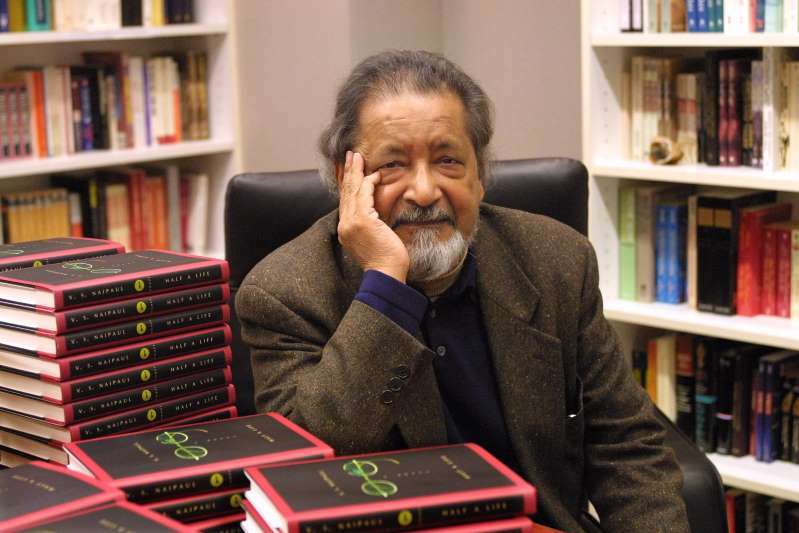 Vidiadhar Surajprasad Naipaul was born on Aug. 17, 1932, in Chaguanas, Trinidad, where his paternal grandfather had emigrated from India in the 1880s as an indentured servant to work on the sugar plantations. His father, Seepersad, was a newspaper reporter for The Trinidad Guardian and an aspiring fiction writer who as a child was luckily allowed to go to school; his older brother was sent to work in the cane fields for eight cents a day and his sister remained illiterate. His mother, Droapatie Capildeo, was from a large, prosperous family, and when Mr. Naipaul was 6 the family moved in with them in a big house in Port of Spain. Ferociously prolific, Mr. Naipaul published a book every year or two for much of his career. His breakthrough was his joyous, deeply autobiographical fourth novel, “A House for Mr. Biswas” (1961). Set in Trinidad, it is the story of a middle-aged journalist’s efforts to free himself of his dependence on his wife’s wealthier, domineering family and lay claim to his own corner of the world. Written when he was not yet 30, the book cemented Mr. Naipaul’s standing among the most important writers of his generation; writing in The Times in 1971, Nadine Gordimer, the South African novelist and later a fellow Nobel laureate, called it “magnificent.” It was eventually published by the Modern Library of 20th-century classics. In 1955 Mr. Naipaul married Patricia Hale, an Englishwoman he had met at Oxford. The two were extremely close — she read all his work in progress — but their relationship was puzzling to outsiders, many of whom saw her as self-effacing and subservient. Although she often traveled with Mr. Naipaul, Ms. Hale is mentioned only once in his books, and not by name. The couple never had children. His childlessness, he told The New Yorker in 1994, “really comes from a detestation of the squalling background of children that I grew up with in my extended family.” He also confessed that he had been “a great prostitute man” in the early years of his marriage and acknowledged that in the 1970s he had fallen in love with an Anglo-Argentine woman who became his longtime mistress. After Ms. Hale died of cancer in 1996, Mr. Naipaul dedicated a new edition of “A House for Mr. Biswas” to her memory. Some found his portrayal distasteful. Derek Walcott, the Caribbean-born poet and winner of the 1992 Nobel Prize in Literature, called him “V. S. Nightfall” in a poem, and said his prose was scarred by his “repulsion towards Negroes” and the “self-disfiguring sneer that is praised for its probity.” Yet Walcott was pleased when Mr. Naipaul won the Nobel Prize. “It will mean something for the region,” he told The Guardian. In 1964 Mr. Naipaul published the first of three travelogues about India, “An Area of Darkness.” He found that in spite of his Indian origins, he did not belong there at all. “Actually, I think ‘A Bend in the River’ is much, much better than Conrad,” Mr. Naipaul said. Mr. Naipaul’s writing about Africa drew criticism from many who were unsettled by his portraits of Africans. The Nigerian writer Chinua Achebe called him “a new purveyor of the old comforting myths” of the white West. Always attuned to the tides of history, Mr. Naipaul began to travel in non-Arab Islamic countries around the time of the Islamic Revolution in Iran. He visited Iran, Pakistan and Malaysia in the late 1970s, when they were witnessing a rise in political power and Islamic fundamentalism. His first travelogue, “Among the Believers,” was published in 1981. A sequel, “Beyond Belief,” followed in 1998. These books were harshly criticized. The critic and Palestinian rights advocate Edward Said argued that Mr. Naipaul had interviewed only those who would confirm his pre-established thesis about flaws in Islam while playing down local political situations that might better explain the rise in Islamic fundamentalism. [post_ads]Mr. Naipaul increasingly lamented the limitations of fiction. The novel had reached its peak in the 19th century, he said, and Modernism was dead. Instead, he thought nonfiction better captured the complexities of the world. He said he wrote his novel “Half a Life” (2001) only to fulfill a publisher’s contract. In 1996, two months after the death of his first wife, Mr. Naipaul married Nadira Khannum Alvi, a divorced Pakistani journalist more than 20 years his junior. She survives him. He had met her at the home of the American consul-general in Lahore. In 2003 Mr. Naipaul adopted Nadira’s daughter, Maleeha, who was then 25. The writer Paul Theroux, who was one of Mr. Naipaul’s closest friends, had a falling out with Mr. Naipaul not long after the marriage to Ms. Alvi. In his book “Sir Vidia’s Shadow” (1998), Mr. Theroux documented the arc of their complicated literary friendship, which began in Uganda in 1966 and ended abruptly in 1997 after Mr. Theroux saw books he had written and inscribed to his mentor listed for sale in an auction catalog. He depicts Mr. Naipaul as a great inspiration as a writer, but also petty, cruel and needy. The two men later reconciled.